Out today in North and South Magazine, a profile piece on Rob Suisted, his travels, photography and new book Majestic New Zealand. Click for a read. Update 22 Jan 2010: We now have signed copies of Majestic New Zealand available for supporters. If you’d like to consider a copy, have a look here. Hi Folk, here the Spanih Guy you met in Viva la Panjim. Nothing is casual but causal. Who the hell would have told you that one year ago, when you said : do you want company? a year after I´m being involved in one of your interviews which is not too bad. I feel good about that. Now that i remember ,what was about de Bullet business? One question. I´m checking prices on the internet for a new Digital Photo Camera ( I´m thinking seriously on a Eos 7D) and surprisingly I´ve discovered an interesting NZ e-shop called Globalmediapro . ¿Have you heard about them? 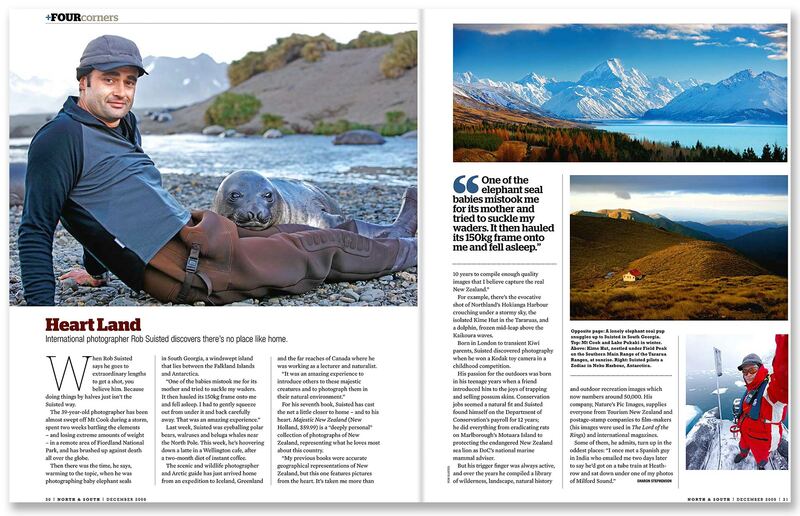 You're reading Nice profile piece in latest North and South Magazine about Rob Suisted at Nature’s Pic Images Blog.